Ah, total luxist envy of pro cappucino makers!! While strolling to a meeting today in Old Town, I stopped for a cappucino at Fontaine Caffee & Creperie. Wow! What a gorgeous place! 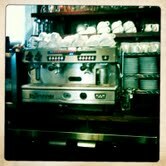 But what struck me was the purty espresso machine. I love Gaggia, I love copper, but this one – this was special! It’s a La Speziale. It was especially fun to take the shot with the Hipstamatic app on my iPhone. Vintagey and so chic. Posted in Uncategorized and tagged drinks, envy, fabulous, luxury. Bookmark the permalink.